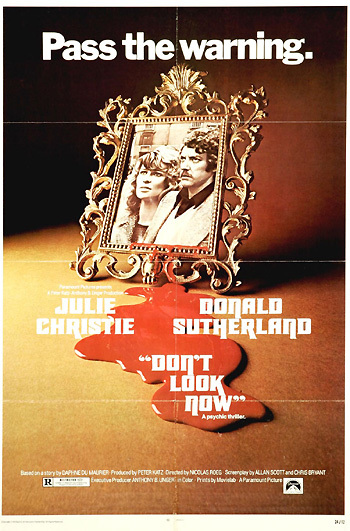 Don't Look Now (1973) is British director Nicolas Roeg's haunting and classic "shattering" supernatural thriller (his greatest film), and depiction of grief, based upon the 1971 Daphne du Maurier short story tale. The fatalistic and portentious film was advertised as a "psychic" thriller (the film's tagline was cautionary: "Pass the warning. A psychic thriller"), interweaving the macabre and everyday life. The film's title was quite appropriate - referring to imperfect vision. It delivers both danger and warning ("Don't"), and seeing, watching and reflecting ("Look") in the present ("Now"), and hints as a whole that one must overlook tragedy, find grace, forgiveness and meaning, and move on with life. The pretentious director Roeg was well-known as the creator/director of a number of daring, striking art-house films with random, non-linear sequences (both flashforwards and flashbacks), fractured and fast-cutting editing (and enigmatic visual clues), images that suggest memories or dreams, skewed camera angles, and recurring motifs and themes of alienation from culture, sexual obsession, and apprehension. This was his third feature film, following Performance (1970) and Walkabout (1970). His next films were the sci-fi The Man Who Fell to Earth (1976), Bad Timing: A Sensual Obsession (1980), Eureka (1982), Insignificance (1985), Castaway (1987), the surrealist Track 29 (1988), and even the notorious Full Body Massage (1995), a Showtime movie with Mimi Rogers and Bryan Brown. This intense, disorienting, chilling mystery/drama told with a calm and leisurely-pace, was in the same year as another scary "horror" film The Exorcist (1973), and contained many of the more traditional elements of the horror genre: a serial killer on the loose with corpses of victims piling up, psychic-ESP abilities and premonitions of death, and a dark foreboding setting. It told about a recuperating, grief-stricken married couple, Laura (Julie Christie) and art restorer John Baxter (Donald Sutherland), in Venice for work and relaxation after the tragic accidental drowning demise of their daughter Christine (Sharon Williams) at their English country estate. At every turn in the ancient port city, the bereaving heartbroken couple were reminded of death. The popular, fabled Italian tourist city threatened by rising waters (apt for a film about a tragic drowning) figured prominently in the film, although it wasn't portrayed as an attractive city of romance and passion. It was filmed in the dead of winter by gifted cinematographer Anthony B. Richmond, and was seen here as old, haunted, doom-laden, frosty, foggy and damp - with sinister, splintered shadows, grey skies, and darkness, labyrinthine dead-end alleyways with rats, rotting buildings and churches, half-empty cafes and hotels, peeling walls, tarnished stone, desolate streets and murky canals (Heather: "It's like a city in aspic left over from a dinner party and all the guests are dead and gone"). In addition, the off-kilter city was plagued by a series of grisly, unsolved murders. The fleeting image of a figure in red, a premonition of death, has been seen in many films since, including: Flatliners (1990), Spielberg's Schindler's List (1993), M. Night Shyamalan's The Village (2004), Dark Water (2005), Hostel (2005), The Omen (2006) and even James Bond's Casino Royale (2006). The dreamlike images of reflections and mirrors, cavernous walkways, and sightlessness hinted at the world of the afterlife - are all John's self-fulfilling dying visions that culminate in his own death. he also makes a comment about the "good question" asked by his daughter about flat pond water: "Nothing is what it seems"
Christine's Action Man pull-string doll commands: "Action Man patrol - fall in"
Laura is greeted at the airport by a misspelled sign: "Sig-ra Baster"